For the Public: Find a home organizing or business productivity specialist in Colorado. For NAPO Members: local education, business and networking support. The National Association of Productivity and Organizing Professionals is a worldwide non-profit association of approximately 4,000 organizers and productivity specialists. NAPO educates its members in productivity and organizing principles and promotes the recognition and advancement of the professional organizing and productivity industry. NAPO members take courses in ethics, general and specialty types of residential and business organizing, and sound business practices. 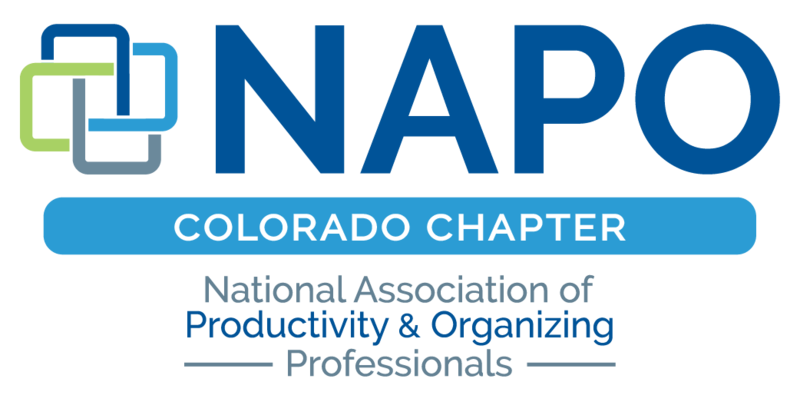 NAPO Colorado is an affiliated chapter of the National Association of Productivity and Organizing Professionals. NAPO Colorado provides locally based education programs, networking, mentoring and business support to our members. We also provide organizing resources to the Colorado public, such as our Find an Organizer listing of NAPO Colorado chapter members, presentations by our Speakers Bureau, and annual education and community events. NAPO Colorado members also volunteer with local nonprofits, through GO Month and Quantum Leap activities. NAPO Colorado includes Business Partners, local affiliated businesses such as closet and garage companies, junk and donation removal services, storage companies, home repair companies, housecleaners, appraisers and more. Business Partners attend NAPO Colorado chapter meetings and events, take part in our educational and volunteer activities, and are helpful resources for our members and their clients. We invite interested local affiliated businesses to contact us to see if NAPO Colorado is a good fit for your marketing and networking goals. NAPO Colorado collects 900 shoes for Soles4Souls during GO Month! Join us on February 4 to learn how to tame your digital clutter. and is not entitled to act on behalf of or to bind NAPO, contractually or otherwise.